Yoshi, his now-faceless toy and his favorite book. Lately, the Casa de New Dork has not exactly been an environment conducive to literary pursuits. My girlfriend and I adopted a mini-dachshund named Yoshi last week, so reading time (and sleep) has been scarce. But Yoshi coming to live with us is really exciting and has been a lot of fun. Yoshi's arrival has also gotten me thinking about dog books, and how few I've actually read — either fiction or non. So maybe you can help — what are your favorite dog books? Any recommendations as far as books that'll teach me to train a dog how to stop barking and lunging at other dogs three times his size? Anyway, here are a few dog books I've read, and a few I've heard are good and I mean to read. The first book that came to mind was one I enjoyed a lot — The Story of Edgar Sawtelle by David Wroblewski. This was one of those books that went viral about two years ago, sort of like The Help this year. And then Oprah helped even more by selecting it for her book club. But just so we're clear, I read it before Oprah picked it. The story, which is an inventive retelling of Hamlet, is about dog breeders in rural Wisconsin. The only other dog books I've read, at least that my sleep-deprived brain can conjure up right now, are childhood classics — books I read when I was just a pup myself. Of course, any dog book list would be incomplete without Old Yeller, which if you're a dog lover may be the saddest book of all time. Then, there's The Call of the Wild — which made me want to be a dog-sledder. And, finally, Where the Red Fern Grows , which is one of the first books I remember really loving. Leading off the haven't-yet-read list is the "new classic" Marley & Me . I don't know a single female who has read this book without bawling her eyes out. That's just touching, isn't it? Owen Wilson's silly-looking mug on that movie tie-in cover, though, is enough to take any emotion out of even the most heart-felt book, in my humble opinion. Another non-fiction dog book I've heard is good is Tell Me Where It Hurts subtitled A Day of Humor, Healing and Hope In My Life As An Animal Surgeon, which pretty much explains it well enough. Finally, in the fiction category, I've heard a few dog-lovers say Catherine Schine's sort of obscure novel The New Yorkers isn't too bad. So, what say you? What are your favorite dog books? Did you like Edgar Sawtelle? As a first-time dog parent, what books should I grab to initiate myself into this close-knit fraternity? I liked EDGAR SAWTELLE pretty well, though trimming a 100 pages here and there would have helped. My best canine recommendation would be TRAVELS WITH CHARLEY by John Steinbeck. In 1960, Steinbeck took off for a roadtrip around America with Charley, his French poodle. An under-read effort from JS, but really good. The only other book I would recommend in which dogs figure prominently is DISGRACE by Coetzee, but be warned: most of the dog-related elements are about the main characters volunteer work at an animal shelter, and it's pretty sad. But the book is great. I read Shiloh by Naylor when I was about 10 and it blew me away as a kid. If you're okay with reading YA books I would at least consider giving that one a shot. I don't read many dog books myself, the last one was A Dog's Purpose by W. Bruce Cameron. It wasn't bad, but it was a little too close to "blogging as dog" for my tastes. Gotta read The Art of Racing in the Rain. One of my favorite books ever. Also check out One Good Dog, From Bahgdad with Love, A Three Dog Life, Walking in Circles Before Lying Down, and Dog Years. For a great photo books, check out Old Dogs are the Best Dogs. Watchers by Dean Koontz. Yeah, it's about a super-intelligent genetically-engineered golden retriever, but you can't deny that Koontz's unchecked passion for canines (not like that!) seeps from every page. It's also about as good as supermarket mass market paperback type books get. I have two dog books I've been meaning to read--the first is one of those that Rachel recommended (The Art of Racing in the Rain by Garth Stein)--I was told it's narrated from the point of view of a dog owned by a race car driver. The other is A Big Little Life: A Memoir of a Joyful Dog by Dean Koontz--sounds quite different from his usual fare (although I can't help but wonder if the dog in the book that Joel recommended was modeled on Trixie from this book). I think what sold me on this book is that one of the chapters is entitled, "she poops on command, but not just anywhere." 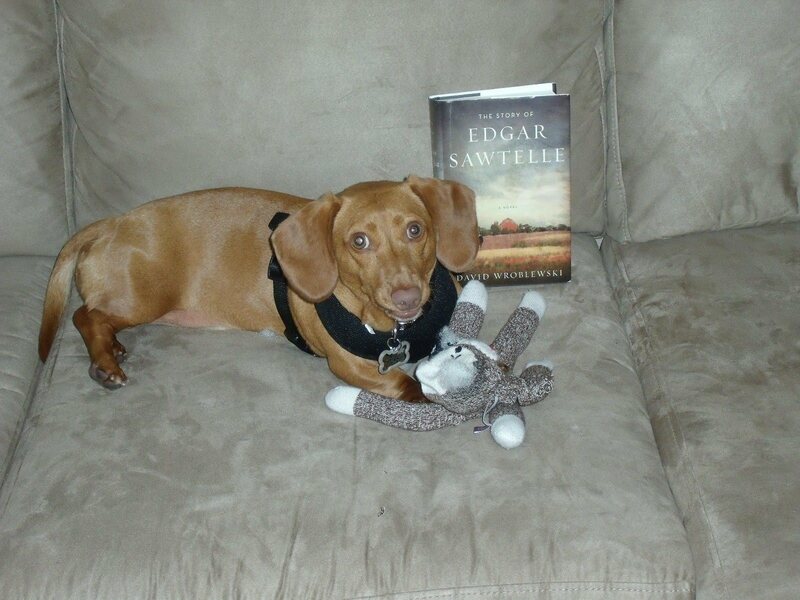 Sadly, I did not enjoy Edgar Sawtelle very much, but the rest that you mentioned, I absolutely loved. I can not forget Where The Red Fern Grows in particular, as it was probably the first book that made me bawl as a child. I also enjoyed Marley&Me, despite what other people say about it. I recommend The Art of Racing in the Rain by Garth Stein! 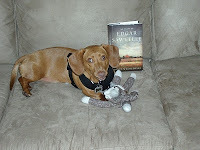 It was a really good book, and is told through the dog's POV. Very unique! Anyway, so happy you adopted someone who needs a new home, and good luck with everything! You'll have the best time with a dog around and I bet Yoshi is ecstatic as well! I'm going to add to everyone else saying The Art of Racing in the Rain... that one was so good! naawwaw you got a puppy! i can't wait until my babies are old enough for us to get a four legged baby in the family. he sounds adorable although sounds like you need to get with the cesar milan (is that how you spell his name?) program and learn to be the 'pack leader'! i recently read 'The Knife of Never Letting Go' by Patrick Ness - if you want to know what a dog thinks and why people need dogs you can't go past this one. It's a book for children, but it was brilliant. It made me want to stand on the street with thousands of copies to shove in people's hands and yell 'read this!' at them. @Amy - You got to mention Shiloh first - nicely done. I knew there was something I was forgetting. Thanks for bringing that to readers' attention. @Home - The Art of Racing in the Rain. Check. Thanks! @SmallWorld - Hmm, not sure about that one. I have a really severe pet peeve regarding talking animals in novels. @Jillian - Thanks. :) Yeah, Yoshi's pretty happy to be here - though he seems to like the female of the household much more than me. I guess that's normal with dogs, though... Vote #3 for The Art of Racing in the Rain...Moved from wishlist to cart! @Mumma - Yeah, he's not quite respecting my authori-TAY yet. It'll come, I'm sure. Thanks for the recommendation - that's one I hadn't heard of before. I'm off to check it out. @Patrick - Yeah, you and Ape (and me) had the same reaction - lots of sag in the middle. Ah, more Jack London dog books - good call! I recommend Jill Ciment's book Heroic Measures. A large part of it features a miniature daschund! AND it's a fantastic book (was a runner-up for the 2009 LA Times Book Award for fiction). AND it's short, so you should be able to read it in between training Yoshi. I have a review posted at http://2manybooks2littletime.wordpress.com/2009/10/02/heroic-measures/ if you're interested. I second White Fang and Where the Red Fern Grows. Also Watchers. @2many books - Fantastic! I just bought the book - that's exactly the sort of recommendation I was hoping for with this post. Thank you! Great review as well - "an inch wide and a mile deep." Very well said! You know, I never caught on that the Sawtelle book was about Hamlet until I read that, about a year after I read the book. ??? How's that for a perceptive reviewer? Ape was right on with Travels with Charley...loved that one! As far as training, just remember that dogs love a sense of structure. Routines are big with them, and rewarding good behavior works better than after-the-fact punishment. They want to please...too bad my kids weren't better trained! I read/saw Old Yeller and Where the Red Fern Grows when I was a kid. This said, I can't read/watch anything about a dying dog. I accidentally rented that movie The Year of the Dog and thought it would be funny. It wasn't. I hate anything that includes dying dogs. Kill anything but a dog. Yoshi? Mario fan or deeper meaning to the name? I think I would have liked Edgar Sawtelle much better had it been much shorter. I agree with The Art of Racing In The Rain but go into it knowing it can get a bit sappy and some of the characters can be a bit stereotyped. The first two dog books that I thought of -- "Travels with Charley" and "the Art of Racing in the Rain" -- are already mentioned here. How about "The Boss Dog" by MFK Fisher (who was/is more known for her food writing)? Enjoy your new family member Yoshi! "The Dogs of Babel" by Carolyn Parkhurst. Both Tell Me Where It Hurts and Marley & Me, that perennial canine classic, had me crying hysterically. And after seeing the film adaptaton of M&M? Let's just say I was so distraught, I had to go home. As in, said good night to friends with whom I was supposed to get drinks; barely made it back to my own house; curled up in bed and didn't want to come out. Needless to say, I shy away from dog books. And not because I don't love them... but because I do. And I love dogs, especially my own golden retriever and rottweiler/chow chow mutt mix, who died three years ago (the source of my Marley-style freak out). I haven't read Edgar Sawtelle but just might wait until I'm a wee bit stronger to do so -- sounds wonderful. And I second Ariel's rec above: Pam Houston's Sight Hound was great. I'm another who thought Edgar Sawtelle was just OK. LOVED Art of Racing in the Rain and I'm looking forward to reading A Dog's Purpose. Anna Quindlen's Good Dog Stay is short and sweet and has me wanting to read more of her work. The Hype Machine: Love It or Loathe It?